Store your bathroom essentials in our range of free standing cabinets to give you a stylish bathroom. We believe that although tthe bathroom is usually the last room in the house to be furnished it is very important you make it a clutter free, organised zone. Our free standing bathroom cabinets are available in a wide range of sizes to ensure you find a storage solution to suit your bathroom. 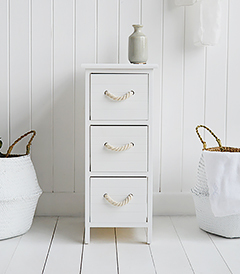 Whether your bathroom is decorated in our elegant French Coastal style or our Beach themed style we have many options to give you an elegant, practical storage solution. Our slim free standing cabinets are avaialble in three styles to fit into even the smallest of spaces, white still providing storage with the four good sized drawers. The New Haven range offers a top drawer with storage baskets for toiletries, towels or make up. Shelves and storage seats can be placed free standing anywhere in the bathroom.